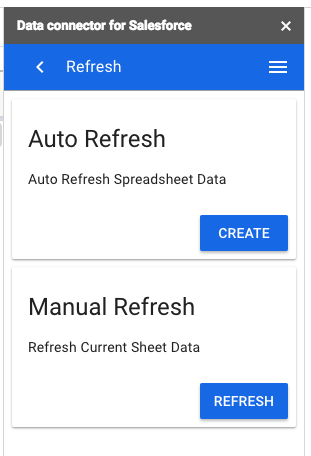 You now have the option to refresh the Salesforce data populated in Sheets using the Salesforce data connector. You can refresh this data manually or schedule the data to be refreshed. 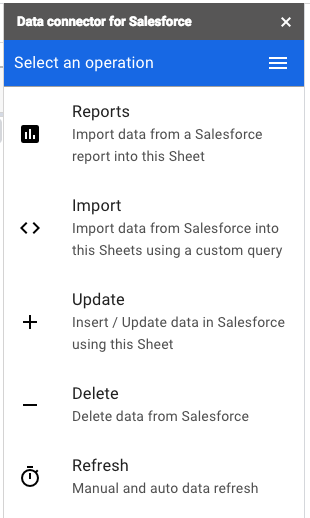 Currently, the Salesforce data connector for Sheets gets data from reports or imports when the sidebar is opened and has been configured. In order to get updated data, users would need to go through the same configuration steps in the sidebar. If you use Salesforce to track important conversations with key leads, you can make sure this data is consistently fresh by scheduling a refresh rather than reimporting the Salesforce data. If your Sales team uses the add-on to import details of their accounts from Salesforce into Sheets, they can schedule this data to refresh daily or even multiple times a day to stay on top of the current data. Open the Data connector from Salesforce Add-On and select Refresh. 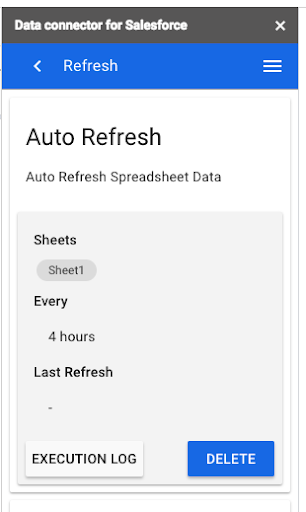 Select Manual Refresh to refresh the current data on your sheet or Auto Refresh to schedule a refresh every 4, 8, or 24 hours. Review your selections and select Create. 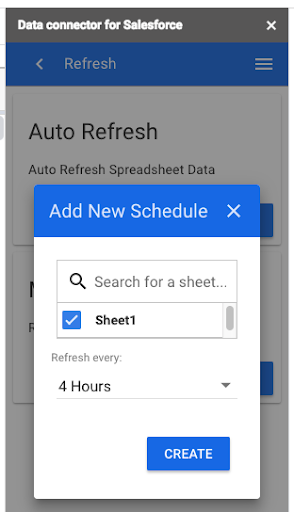 Import, edit, and sync Salesforce data with Google Sheets. End Users: Install “Data connector for Salesforce” from the G Suite Marketplace. Admins: Deploy the Salesforce add-on to your entire domain.